HMH Books for Young Readers, 9780544308329, 32pp. In the wide-awake bed in the full-moon house, everyone is restless! The moonlight is pouring in and no one can get to sleep: not Granny, her grandchild, the dog, the cat, or even a mouse. It's not until a tiny musical visitor offers up a soothing song does the menagerie settle down, and finally everyone is off to dreamland. With a perfectly crafted text and stunning paintings, Audrey and Don Wood reveal once again why they are picture book creators of the highest order. 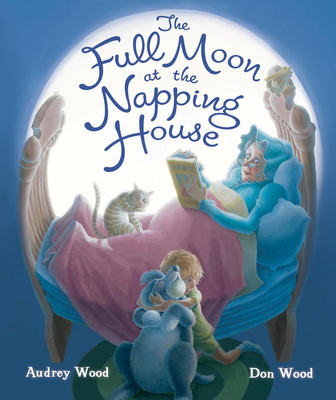 The Full Moon at the Napping House, the highly anticipated follow-up to their beloved classic The Napping House, is the ideal book to share at bedtime or anytime. "A wonderful storytime addition, particularly where The Napping House is popular." "Concluding in a state of cozy restfulness, the Woods' story serves as a pleasing inversion of the previous book and works even better as a bedtime read." "Softly rendered, luminous art illustrates and expands the lilting text, incorporating varying perspectives and eyecatching, whimsical details."